Dancing dolls have been used for at least the past one hundred and fifty years in Great Britain, and are also known in Ireland and north America. They are by no means exclusive to East Anglia, but, as with singing, stepdancing and music-making, the tradition seemed to survive in this area better than in many others: we have come across numerous examples, and they are still being made in the region. The earliest known model is now in Cliffe Castle, Keighley, Yorkshire, and was apparently exhibited at the Great Exhibition in London in 1851. It is a female figure dressed in skirt, petticoat, bodice and shawl. Apart from this, most existing dolls date from the first half of the twentieth century. Patents for the commercial production of dancing dolls of various models exist from the late 19th century on both sides of the Atlantic. An older model, known as a “poupee a la planchette’ was operated by a string attached to musician’s leg, on a board placed on the ground. This is well documented in historical illustrations and appears to have been popular in Europe as well. 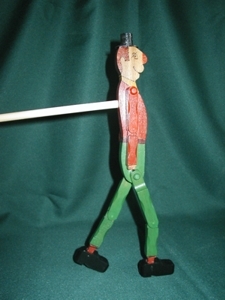 A typical jig doll is between 20cm and 30cm in height, although there are examples from Suffolk of both smaller and larger ones, and has jointed arms, hips and knees, and also in some cases, ankles, allowing a movement which mimics step-dancing. They were not designed to be children’s toys, and in the past were owned by adults, and used for their own entertainment in pubs etc, and sometimes for grandchildren, nieces and nephews to watch. During a musical evening, they would be brought out if there was some live music, in much the same way that a live stepdancer would contribute to the proceedings. They were also popular with street musicians and buskers, as their great visual appeal invariably attracts a fascinated audience. They are usually three dimensional and carved or painted as a particular character – sailors being the most popular, and several soldiers and clowns have also been found. In the Bethnal Green Toy Museum, there is one modelled as a First World War soldier – ‘Tommy Atkins’, said to have been made in the trenches. One model was made commercially in the early 20th century, and is known as Mr. Jollyboy. 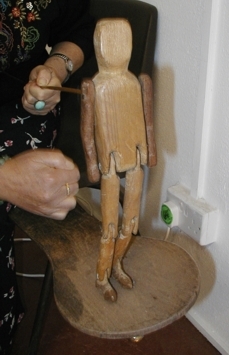 There is a story that an employee of the Strangers Hall Museum in Norwich found a cardboard box containing one of these jig dolls on top of a dustbin and removed it to the Museum: this doll was displayed at the Big Jig exhibition in 2004 (see photograph below). If you have a dancing doll, please let us know, and send us a photograph. After the Big Jig exhibition at the Traditional Music Day in 2004, we are collating information on dancing dolls, and are collaborating with Pat Pickles on a new book in the future. 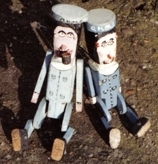 Jig dolls have been made for centuries, usually in garden sheds and on back-doorsteps, and used for entertainment at home, in pubs, on board ships and on the street. 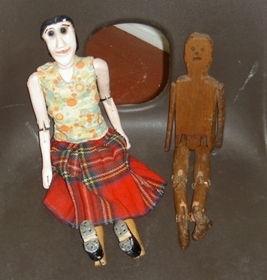 They are wooden dolls with jointed arms and legs, and a stick protruding from the back which is held and the doll ‘jigged’ up and down on a narrow board of flexible wood. Each doll is decorated differently, sometimes just painted, sometimes with fabric and additions such as ‘segs’ to the shoes, which create a dramatic clattering sound. They are a great visual attraction, and in skilled hands they also provide percussive rhythmic accompaniment. If you’ve got one, or know of someone who has, please do get in touch. During the Traditional Music Day on 4th September 2004, a unique exhibition was on display. (See photographs below.) It featured nearly a hundred different examples of dancing dolls. 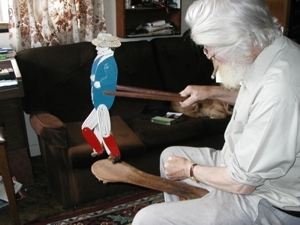 A dancing doll, or jig doll, is a home-made puppet designed to step-dance on a narrow wooden board, and operated by holding a stick in the back and bouncing the board lightly. 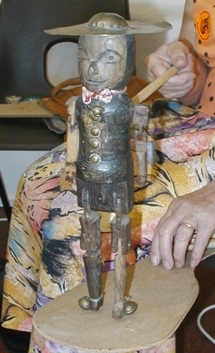 Pat Pickles, author of the only book on the subject, brought her collection of over 60 items, and many individuals brought along their own jig dolls for the day as well. 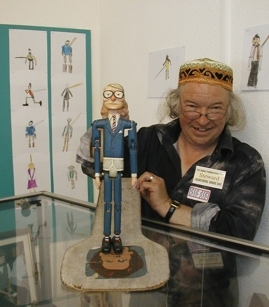 Amongst the collection were historical dolls such as the Harry Lauder look-alike and the primitive sailor figures made in Stowmarket, as well as more contemporary designs including one of ex-Prime Minister John Major stepping all over an image of Maggie Thatcher on his board! 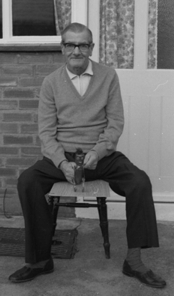 There were also dolls which had belonged to Harry Cox and Fred Whiting, well-known traditional singers from the region, and photographs of some examples which were not able to be actually displayed. 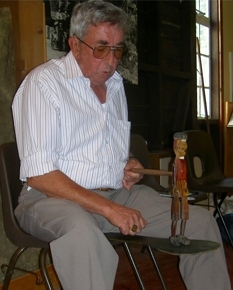 The East Anglian Traditional Music Trust has also commissioned a collection of jig dolls, for use with community projects and schools work. These have proved very popular since we’ve been taking them out. 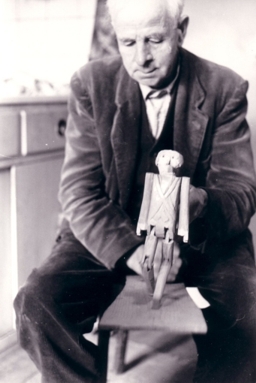 Harry Cox’s (Catfield, Norfolk) home-made doll. Pat Pickles’ & Katie Howson’s fantastic new book on jig dolls, ‘The Brightest of Entertainers’ , published by The East Anglian Traditional Music Trust, is now available from our online shop. We are always interested to add to this list and invite other makers to get in touch with us.